A strengthening US dollar in combination with some new form of global debt or market crisis would result in a large portion of foreign capital investments transitioning into the US equity market and the metals markets. Gold is the primary indicator of this level of fear and should be watched as the leading metal representing any crisis event. 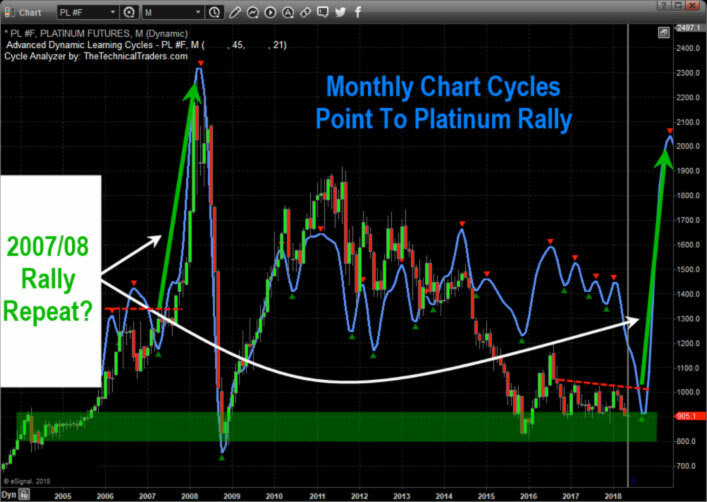 Yet, platinum is proving to be the big opportunity for traders because of a number of reasons. This chart shows what I believe are the primary Weekly price channels as well as my price cycle analysis (the Cyan-colored line). One can quickly see the cycle patterns rotating higher with price advances and lower with price declines. The current price decline is set to end right now (May 1st) and begin a new price advance which will likely result in price retesting the high channel near $96. This would be the first level of resistance and where I would expect price to stall before possibly advancing further. 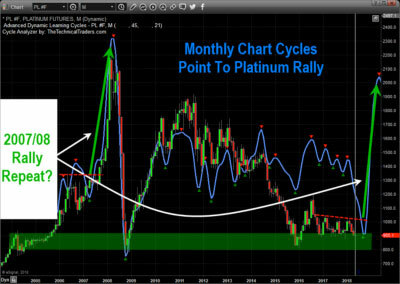 This second chart below is of Monthly Platinum futures showing the same advanced price cycle analysis as well as the congested price channels near the right edge of the chart. Traders should notice the price consolidation over the past year or so near historical price lows in addition to the price cycle analysis indicating that price should be declining over the past few months. I believe this price decline to near the $900 level will act as support for the Weekly cycle price advance and that once the price of Platinum breaks the $1040 level it could be advancing much higher. Intermediate price resistance can be found near $1200 and $1400, but beyond that $1800~1900 is the critical resistance level. I think one of the most overlooked chart time frames is the monthly. Sure, it’s slow moving but man, the opportunities are fantastic. 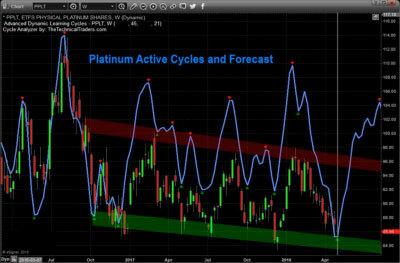 Last January I posted as similar trade setup to this Platinum article but it was a Palladium article sharing a swift 19% collapse in price, so don’t be fooled by monthly chart analysis! In my opinion, the only thing we have to wait for to confirm this upside rally is a closing price breach of the $1040 level in Platinum. A closing price bar above this level will indicate a price breach of the trading channels (see the Weekly chart for red price channel area) and provide strong indications that the Monthly price cycles are accurate. This would confirm the potential for a much higher price swing with $1400 to $1800 becoming a real possibility later this year. Capital will flow into the US equities markets and metals should there be any type of global debt issues, global stability issues, or war. Watch the leader, Gold, for continued signs of a bullish price advance and don't miss out on this tremendous opportunity unfolding in Platinum later this year. 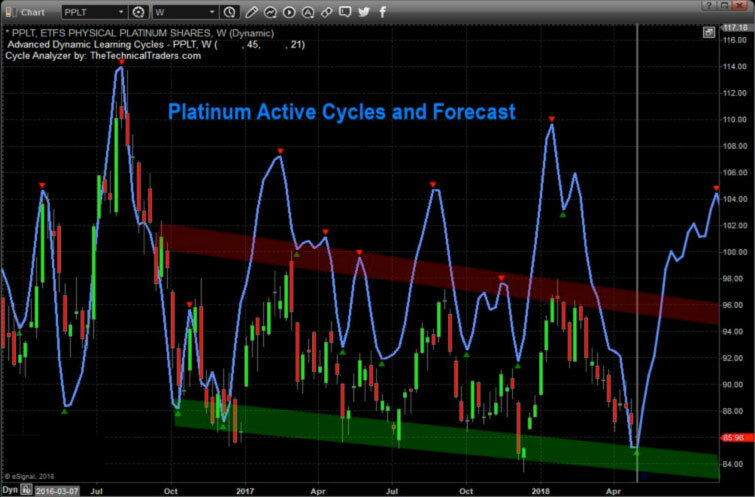 My analysis shows that Platinum could rally 60~100% over the next 12+ months. You can receive my daily pre-market analysis, index, oil, and precious metals trades by joining my Wealth Building Newsletter. Disclaimer: This material should not be considered investment advice. Technical Traders Ltd. and its staff are not registered investment advisors. Under no circumstances should any content from this website, articles, videos, seminars or emails from Technical Traders Ltd. or its affiliates be used or interpreted as a recommendation to buy or sell any type of security or commodity contract. Our advice is not tailored to the needs of any subscriber we advise that you talk with your investment advisor before making trading decisions. This information is for educational purposes only.